Being JOYful and happy is more than just a state of mind – it is also a state of health. So how is your day to day health? Do you eat sensibly, exercise regularly, sleep 6-8 hours a night and express happiness most of the time? Or do you run around between tight schedules of home and work, eat fast food on the run, drink caffeinated drinks and alcohol and fall into bed around midnight to toss and turn for a few hours before starting over again? Stress is a happiness killer when it comes to our bodies. Scientific evidence indicates that over 90% of all dis-eases are related to stress. So how do we encourage our body to be happy? A change to our lifestyle might be in order. Less late nights and take-away meals and more fruit and vegetables and a good nights sleep. And we can encourage the production of our brains ‘JOY juices’ to produce more happiness and feelings of wellbeing. The brains ‘JOY juices’ are the natural happiness-enducing drugs that your brain produces daily. Endorphins – the brains painkiller which is 3 times stronger than morphine. Serotonin – a natural calmer of anxiety and a depression reliever. Dopamine – promoting alertness and a feeling of enjoyment. Imagine if you created more of the above natural brain chemicals. How would your life be different? You would likely be calmer and less anxious, with no depression. Your pain threshold would be higher and you would be more alert and happy in all situations. Of course it does, so take the following tip to optimize and encourage your brain cells to produce more of the good ‘JOY juices’. TURN THAT FROWN UPSIDE DOWN AND SMILE…yes smile. Do it, right now and feel lighter and happier immediately. Frowning triggers the secretion of the stress hormones cortisol, adrenalin and noradrenalin. All these chemicals increase your blood pressure, weaken your immune system and increase your susceptibility to depression and anxiety. And for a great boost and to multiply the benefits of smiling, enjoy a good belly laugh. We all know that laughter is the best medicine. 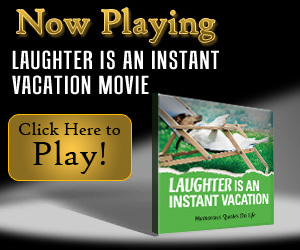 Laughter will lower stress hormones and shoot your happiness hormones into high gear.